This past Sunday I attended a ward that wasn’t my own. I sat in the back and left promptly after sacrament meeting. But I’ve been thinking about one of the talks ever since I left the building. The man started his talk with a story about a friend of his recently announced that they were leaving the church. He repeated how they had been overcome by doubt. After expressing his disappointment, he followed up with the story about the individual stranded in the ocean who is picked up by a weathered boat and fisherman (You know, this one). After spending some time on the boat and noticing all it’s dents and blemishes, the rescued becomes worried and asks to be let back into the ocean to swim the remainder of the way to shore on their own. After the speaker finished the story, he remarked proudly that the boat represents the church and the fisherman is those called to lead it. I understand the point of this story. Humans and the institutions they create cannot be perfect. In fact, small dents, paint chips, and difficult machinery shouldn’t keep us from utilizing those institutions for good. But this story, especially when listening to it yesterday, fills me with unease. It seems to belittle and invalidate the feelings of those who are sitting in doubt while simultaneously diminishing the real institutional flaws of the church as mere “dents.” Feeling doubt is often more than uncomfortable, it is painful. And sometimes it feels like the only place on the boat you’re comfortable being requires you to hang over the edge. When we say that people who doubt are willingly climbing back into the ocean after being rescued by a perfectly safe boat, we ignore the fact that getting back into the ocean might be the only real option someone has. Sometimes the dents are actually leaks and the boat is slowly sinking. 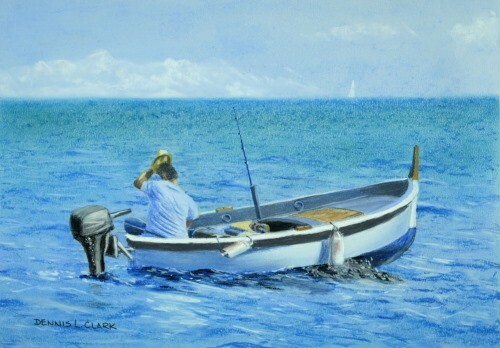 Sometimes the faulty mechanics are keeping the fisherman from being able to keep the boat on its proper course. The paint chips can be signs of a system unwilling to fix or even acknowledge the errors of its past. Some days I feel like climbing back into the ocean. Sometimes that really seems like the safer option. The boat is rocking and sometimes looks like its veering off course. Right now I am clinging to the side rails hoping that my questions do not become to heavy to carry. But if they do, if I find the ocean is becoming more inviting than the boat itself, I don’t need a fisherman to gently let me back in the water and leave. I also don’t need a fisherman who will jump in the ocean to save me, dragging me back onto the boat I was trying to escape. I need fishermen who are willing to jump in and tread water with me while I figure things out. I feel like all I think about is doubt (I even think this is my third post on this topic in this past year). And maybe it isn’t productive to have this focus. But doubt is a natural companion to faith. It shouldn’t be ignored and it shouldn’t be shamed. I don’t need stories telling me how I should be ignoring my doubts. I can’t ignore them. They are as much a part of my experience as my faith. Ignoring them doesn’t make them go away. What I need is people to sit with me and listen, for people to get in the ocean with me and tread. Maybe you’re already here in the water. Maybe we can find each other and together face our doubts head on. I remember growing up thinking that one of the worst possible things you could do was litter. I recall many times when my parents would vocalize their disgust witnessing people throw trash out of their car windows or seeing garbage littered across the park. It was ingrained in me not to litter from such a young age. My family also started recycling when I was younger. We started by having to divide up the cardboard, plastics, glass, and paper and drop it off at recycling bins behind our local grocery store. When recycling become more commonplace, my parents paid to have it picked up with our trash. My grandparents composted much of their waste as well. I grew up knowing there were simple steps to limit the waste being put into landfills or oceans. Lord, What Wilt Thou Have Me to Do? The millennial generation overall has shown to be less religious than previous generations, a phenomenon that has not gone unnoticed by church leadership. Someone who studies religion knows that there are many Gods and ideas of divinity throughout theology. They understand the differences between these beliefs and the intricacies of what God means to many people. However, I am not that person, so my knowledge is much more limited. But recently I have started to notice the subtle differences between the God that I worship and the God that people around me seem to worship. Of course, the God that I have known and learned about throughout my life is different from the one(s) that my Hindu, Muslim, and even various Christian friends know. But the more I question my own beliefs and the more I learn about the beliefs of others, the more I am sure that none of us believe the same things, even when we claim the same religion. I feel like there are a lot of directions I could take this post. I have many thoughts because it’s directly pertinent to my current experiences in the church. I am a young, unmarried BYU graduate. I have faced and am currently facing the woes of dating within the LDS culture. I’ve seen roommates and friends get married, all while remaining very single. I’ve gotten really upset about how my dating life is playing out. I could write a novel about this topic and still not discuss everything worth discussing. This past week in Relief Society we talked about conversion. Specifically, we addressed that new converts need to feel not only converted to the gospel itself, but also the church culture. There is a new language, new rules, and new etiquette to learn. And often when converts do not feel like they understand or belong, they fall away. I’m finding it hard to piece together the words and emotions I wish to convey on this topic. Mostly, because it’s difficult for me to explain but also because it is painful. The way women are viewed in the church is something I think about continuously. I am aware of my womanhood and the effect that has on my existence. Unfortunately, a lot of the effects I feel are due to others’ perceptions of womanhood. Since the LDS church plays a large role in my life, the way I feel viewed by the church community is often at the forefront of these thoughts.